14.1% alc., $17 (retail $28). Double Gold Medal 2011 Sonoma County Harvest Fair. · Moderately light reddish-purple color in the glass. Bright aromas of black cherries, black plums and blackberries, veering to the ripe side. Wood-kissed darker fruits on the palate with a citrus peel note in the background that lingers on the finish. Lacks conviction and a little too oaky, but pleasant. Decent. 14.1% alc., 350 cases, $35 (retail $40). Gold Medal 2011 Sonoma County Harvest Fair. · Moderately light reddish-purple color in the glass. 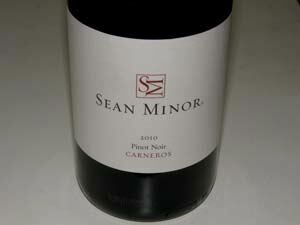 Aromas of very ripe dark berries and plums with hints of prune and oak. Middleweight very ripe fruit flavors with notes of Hoison sauce and rhubarb. A bit linear and bogged down with oak. Soft tannins make for easy drinking. 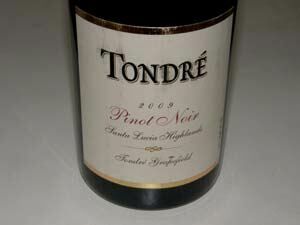 Disappoints for a medal winner, but may find fans among those who prefer very ripe flavored Pinot Noir. Good. 12.3% alc., $6.99 (but often discounted). 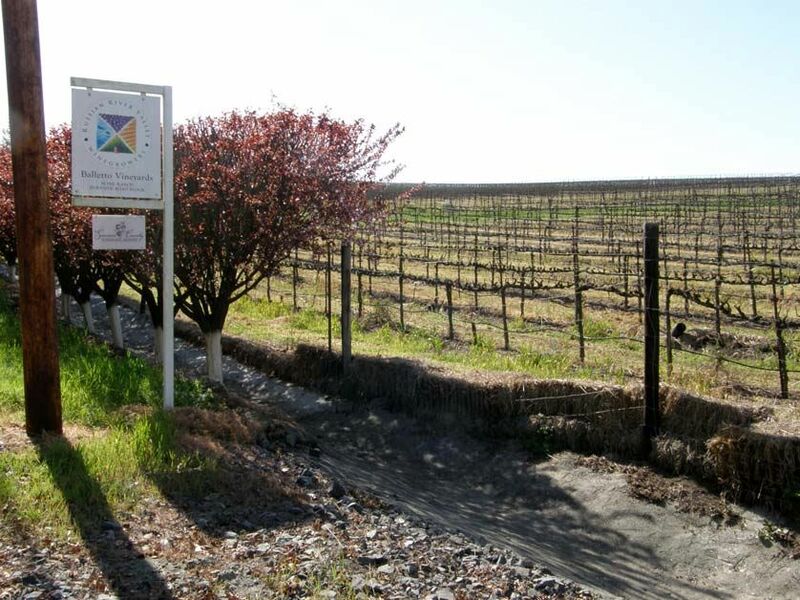 The most awarded California wine brand under $15 in United States wine competitions. · Medium reddish-purple color in the glass. Aromas of dark red berries, cherry snow cone and sweet pipe smoke. Mid-weight flavors of cherry cola and sassafras with a slight confected quality. Most certainly includes other red varieties besides Pinot Noir. Reasonable good structure, but a bit shallow fruited. Soft, easy drink ability. Throw in a few ice cubes in the summer, and this will make for a refreshing drink. All things said, a great value. Widely distributed. Decent (+). 14.1% alc., $26.99. · Darkly colored in the glass. A varied array of aromas including very ripe, roasted dark berries, black currants, oak and bell pepper. 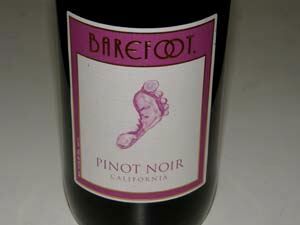 Very ripe fruited with flavors of black raspberries, boysenberries and plums with a vegetal undertone. Rich, sultry and earthy with some length on the finish. Considerable better the following day from a previously opened and re-corked bottle. Good. 13.5% alc., $12.99, screw cap. · Medium reddish-purple color in the glass. Pleasing aromas of red berry pie, black cherries and complimentary oak. 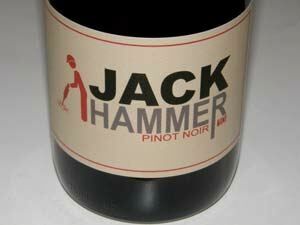 Medium weight flavors of dark cherries and a hint of oak spice, finishing with a cherry and raspberry laden hi note. A silky textured wine that goes down easy. Good (+). 13.8% alc., pH 3.82, TA 0.53, $25. From very cool vineyard sites in a cool vintage with delayed harvest. 100% de-stemmed, 5-day cold soak, open top tank fermentation, gentle punch downs three times a day, aged 6.5 months in 23% new French oak. Lots kept separate throughout the winemaking process and blended at the end. A broad pallet of clones including 115, 667, 777, 828, Pommard, Martini, Calera, Mt. Eden, Swan, 2A and 23. · Moderate reddish-purple color in the glass. Nicely perfumed with aromas of fresh strawberries, cherries and oak spice, fading some over time in the glass. Crisp and juicy in the mouth with a lighter weight array of dark red cherry and ollaliberry flavors with complimentary oak-driven notes of spice and chocolate. Lacks a bit of finishing length, but overall a fine, reliable daily drinker. Easy to find as it is ubiquitous on grocery store top shelves. Good (+). 13.8% alc., pH 3.77, TA 0.54, $17.99. From Bronco Wine Company in Hopland. · Moderately light reddish-purple color in the glass. Some reduction upon opening, eventually revealing aromas of red cherries and smoke. A lighter, nimble style with a cherry core back by a smoky oak flavor that diminishes over time. Decent. 12.5% alc., $6, screw cap. · Moderately light reddish-purple color in the glass. Marked reduction upon opening with aromas and flavors of burnt matchstick. Left in a glass all day, the reduction resolved, revealing aromas and flavors of black cherries with spice and oak char in the background. Light in weight with silky tannins and easy approachability. A quaffable wine that is not up to the quality of previous vintages. Decent. 13.5% alc., $14. · Medium reddish-purple hue in the glass. Shy aromas of dark fruits, forest floor and oak. Lighter weight flavors of dark raspberries and blackberries with a subtle smoky, oak char undertone that dissipates over time in the glass. Velvety soft in the mouth. This wine could use more time in bottle. Decant if you pop a cork now. Good (+). 13.5% alc., $9.99. · Moderate reddish-purple color in the glass. 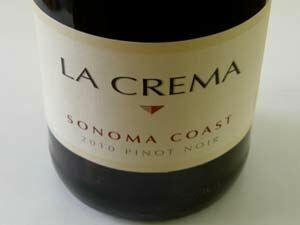 Slightly confected aromas of strawberries and red cherries with hints of spice and pine forest. Soft in the mouth with a moderately intense core of dark red cherry and raspberry fruit with a floral and pine needle sidecar. Soft in the mouth with a short finish. A pretty good Pinot for the money, but the pine forest adjunct (still present the following day from a previously opened bottle) was not pleasing to me. Decent. 14.8% alc., pH 3.66, TA 0.68, 650 cases, $22.50. Winemaker Anthony Craig. Aged 20 months in 37% new Hungarian oak barrels. · Vibrant aromas of dark cherries and berries with notes of oak and hickory. Delicious essence of black raspberries with striking mid palate presence and some persistence on the finish. Notes of plum reduction sauce, spice and sassafras add interest. Still fine two days later from a previously opened and re-corked bottle. Full retail is $45 and it is hard to find (not sold on the website: try Bottle Barn in Santa Rosa, CA. or Total Wine) Very good.